Next week, I will teach a one day, watercolor workshop at the Britt David Cultural Arts Studio in Columbus. It will be my first class at that location and I’m excited about the new opportunity. 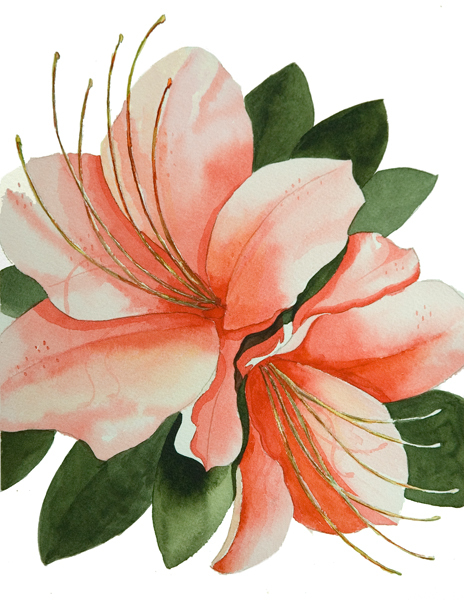 We will be painting “Prunifolia Azalea”. As with all of my “Watercolor Crash Courses!”, no drawing or painting experience is required. Adults that have always wanted to try their hand at watercolor will get right to work, mixing colors and using basic watercolor painting techniques. The class is scheduled for Tuesday, September 7, 9:15-2:45, tuition is $65 and all of the supplies are included in that price. Call 706-653-4196 to register. I would like to attend the watercolor crash coarse this weekend if there is an opening.